A record-breaking quadriplegic sailor is preparing to sail solo around Britain in a 20ft boat controlled by her breath. 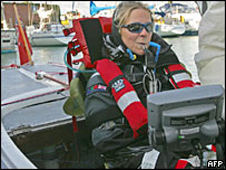 Hilary Lister, 36, from Dunkirk, Kent, became the first quadriplegic sailor to cross the English Channel, in 2005. She solo circumnavigated the Isle of Wight in July last year, becoming the first female quadriplegic to do so. Mrs Lister, who has no movement below her neck, controls the boat using straws to adjust the sails and tiller. She is planning to start her trip in Dover, in her boat, the Artemis 20, on 9 June. It is anticipated the clockwise journey, which will be taken in a series of day sails, will take three to four months. Mrs Lister has been paralysed for seven years as a result of a progressive degenerative disease, reflex sympathetic dystrophy. A rigid inflatable boat will support her on the journey and a motor entourage of two motor homes and a Land Rover will provide land support. Her team will include a crew of four led by project manager Toby May and three shore crew members, while project director Tony Leppard will provide remote assistance. Mr Leppard said: "There is a sense of excitement and trepidation as she makes the final plans. "She is such a brave and courageous young woman and she's really looking forward to it." Mrs Lister has been training off the Isle of Wight and practising emergency procedures, he added. Last year a similar journey was completed in 109 days by Geoff Holt, who is paralysed from the chest down.